On December 3rd 2016 Johannes and me hosted a small board game jam in the local hackerspace in Düsseldorf, Germany. Five people participated and created five unique games in only four hours. It was great fun, a great success and we’ll do it again next year. A few weeks ago Johannes approached me with the task of creating an interesting game from a fixed set of materials (taken from an existing board game). It took around 1.5 hours to lay down the initial set of rules and some background story. After presenting the new game to Johannes two things became clear very quickly: One of my rules did not work out at all AND we wanted to have an event for quick prototyping of board games. The idea of a game jam for board games was born. We wanted it to be similar to a game jam, which are common for video games, but for board games instead. Some research later we had found out that there are a few board game jams around the world. But we did not want to spend 48 hours on this event, even though this is a usual time for jams or hackathons. So we decided to cut it down to one afternoon of design and one evening of play. Board games can be developed much quicker than video games, after all. We announced the board game jam two weeks in advance. Having two modes, creating a game from scratch or creating a game from another game’s materials, we planned for 4 hours of development time and 4 hours of presentation-/playtime. As location we chose the local hackerspace in Düsseldorf, Germany (Chaosdorf). In the announcement we asked for game donations, i.e. games people own but never play anyway. So we started with a pile of games to scavenge and refactor. We received a great collection, with some classics (Mahjongg), some lesser known games (The Secret Labyrinth) and some completely strange ones (GZSZ Das Brettspiel). To provide a starting point we picked two random themes at the beginning of the jam but declared them as optional and just for inspiration. The first one was “Vögel” (birds) drawn from a pack of tarot (also a donation), the second one “Der große Preis von China” (Chinese Grand Prix) picked by clicking “random article” on Wikipedia. First, I chose to refactor the secret labyrinth, because the material, especially the board, is quite unique. Since I could not find a good idea in the first 30 minutes I decided to go for the topic “birds” instead. After a few minutes only, I suddenly remembered a random fact about crows from my genetics 101 class. In Europe there are two crow species that are distinct species, but still able to mate with each other. A mixed offspring, however, is not nearly as fit as pure-bred individuals. Inspired by this example, I decided to make a game about bird migration, where each player takes responsibility for the fitness of a certain species (color). In the game birds are stacks of 1-5 gene tokens. The species of a bird is determined by who has the most tokens in the bird’s genes. The goal of the game is to have the most birds of your species on the board. 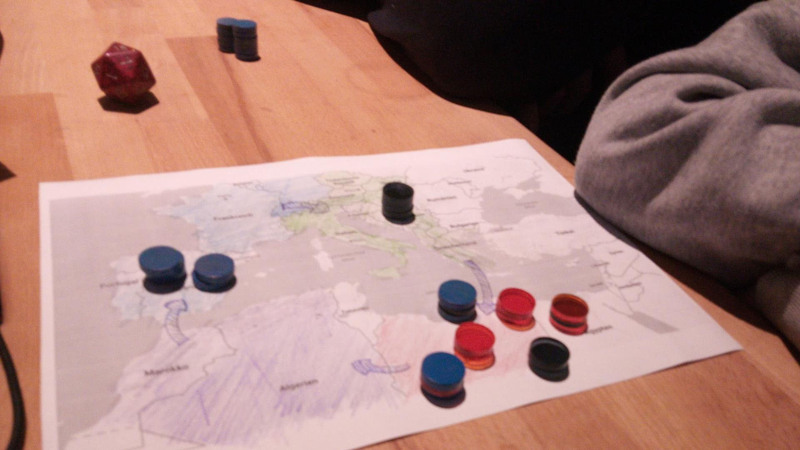 The game starts in Western Europe with each player having two birds with two tokens of the player color. 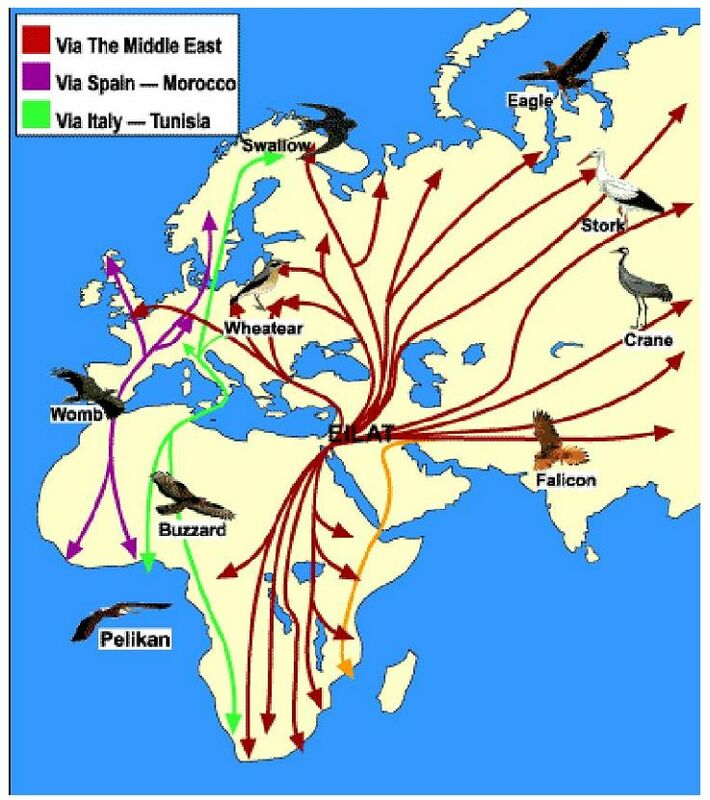 A player can migrate any bird to the next field (Western Europe -> Eastern Europe -> Libya -> Algeria -> back to Western Europe). Players having birds in Europe can forage to gain food tokens. Birds in Europe can be fed (only by the species owner) by spending a food token and will gain another gene token of the player color. Birds in Africa can mate with other birds in the same region. A player selects one of their birds (active) in Africa and any other bird (passive) in the same region to mate with. By rolling a 6-sided die, the position (from the top) of the gene token to propagate into the offspring is determined for both. If there is no token in one of the positions, mating was unsuccessful. If there is offspring but it does not have a dominant color, the 6-sided die is rolled until another token from the active bird goes to the offspring (Note: The offspring can be of a different species than the active bird after this). The game ends after 16 cumulative transits (Algeria -> Western Europe or Eastern Europe -> Libya) of any bird. For scoring, birds with no dominant species identity are taken out of the game. All other birds count 1 point for the species with the most tokens. In case of a tie (two or more players have the same number of birds) the highest total number of gene tokens still in the game wins. In case of a tie the player with the most food tokens wins. If there still is a tie, congratulations, nature wins, as you contributed to allopatric speciation. Mahjong Tactics: Taking apart Mahjong and turning it into a tactical war game. The twist here is that the three different suits (bamboo, dot, character) become army units that work like Rock/Paper/Scissors: bamboo beats dots, dots beat character, character beats bamboo. This makes for unusual combat situations and thrilling duels. Dateninsel (Data Island): Save your data from bugs by transporting them from a server into the cloud. Der Große Sprung Nach Vorn (Great Leap Forward): A strategy game inspired very loosely by the theme “Chinese Grand Prix” in which you try to buy political will to make your commune the best. Kreislauf des Wassers (Water Cycle): A game vaguely related to the rules of pachisi. Roll dice, try to reach your house and if you are lucky, block the way for others. It has been an awesome event. Apparently 4 hours were sufficient for everyone to create a prototype for a board game. And while some of them were better than others, everyone had fun playtesting the new games. The donations helped a lot as we had some stock materials to start with. Also, having a laser cutter on hand turned out to be quite useful for quick (15 minutes) production of 60 tokens. We can probably improve our outreach, as we would have loved to host more than just 5 people. Also after 4 hours of creative outbursts, people were in general rather tired, so we have to consider splitting the event into a development day (4 hours) and a gaming day (open end) instead of having both on the same day. Summing up the event: it was a great success and we will definitely have a second edition in 2017.